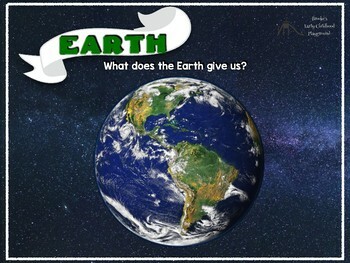 Use this resource as your Earth Day introduction! 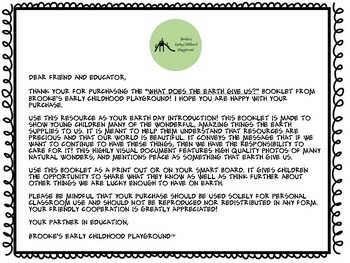 This booklet is made to show young children many of the wonderful, amazing things the earth supplies to us. 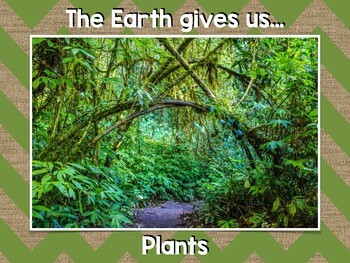 It is meant to help them understand that resources are precious and that our world is beautiful. 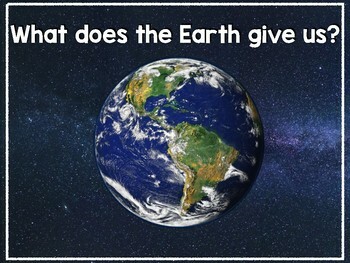 It conveys the message that if we want to continue to have these things, then we take the responsibility to care for it! This highly visual document features high quality photos of many natural wonders, and mentions peace as something that earth give us. It is meant to inspire love and care, and sets the stage for a fruitful discussion about ways to care for the Earth and our natural resources. Use this booklet as a print out or on your smart board. It gives children the opportunity to share what they know as well as think further about other things we are lucky enough to have on earth. It is suitable for early childhood and early elementary school! Brooke's Early Childhood Playground™️. By purchasing and/or downloading this electronic file, you agree to the following terms. Your purchase should be used solely for personal and/or classroom use and should not be reproduced nor redistributed in any form. Your friendly cooperation is greatly appreciated! Thank you for respecting the work of all TpT educators, creators, and artists!